Well that's it for the 2013 draft. Thank you to everyone that came to our site today. Tomorrow (or in a few days) we'll have our Draft Wrap-up with hopefully some quotes from Tomahawks GM Rick Boyd. We set record numbers today for Blog Visits, and Article Visits, so thank you very much. This was our first ever live blog and I'd say it went great and was a lot of fun. Hopefully we can do more of them in the future. Till Next time, Let's Go 'Hawks! 5:45PM Soo- Anthony Saleh played for the Soo Eagles last season. He had no points in five game. 5:40PM Soo- Michael Caruso from Soo Thunderbirds NOJHL. Another defenseman. 5:35: Soo- Brian McFarlane from the North Iowa Bulls NA3HL. He is a defenseman. 5:27PM Soo- Brady Hall from the Boston Advantage U18. 5:24PM Springfield- Thomas Kolaz 5'8" 160 lbs 1996 Forward from St. Louis 18U Blues. 5:17PM Soo- Jimmy Slivka, a 17 year old d-man from the Chicago Fury. Slivka scored 10 points. This is the Tomahawks last pick of the day. 4:58PM- Springfield- TJ Schultz from Chicago Young Americans. 4:57PM- Michigan- Connor Millard from Peoria Mustangs, he scored 13 goals and 7 assists. This is Michigan's last pick. Tomahawks should have two more pick to go in this draft. 4:47PM Soo- Daniel LaFontaine, was ranked in NHL's central scouting list. No stats available. 4:45PM Port Huron- Nick Le Sage, defenseman, From the Minnesota Iron Rangers. He scored five goals. 4:42PM Johnstown Tomahawks-Forest Donovan, from Belle Tire AAA, scored 11 goals and 20 assists. 4:40PM Springfield- Joe Wilkinson, a defenseman from the Chicago Young Americans. He scored 7 points. 4:38PM Michigan- Jeff Beck from Philadelphia Jr Flyers 18U. 4:29PM Soo- Jordan Uhelski, goalie for he Muskegon Lumberjacks of the USHL. Uhelski earned a record of 7-5-4-2. 4:26PM Port Huron- Grant Meyer, a 1996 forward who can score, a lot. He scored 26 goals and 45 assists for the Cleveland Barons. 4:23PM Springfield- Lucas Stewart, a defenseman from Missouri. Scored 15 points for the St. Louis Jr. Blues. 4:11PM Port Huron- Drew Newmeyer, played 11 games with Indiana in the USHL. he scored 7 points. Pete McMahon: From Jesuit High School in Detroit, he scored 9 points in 10 games for the school He is 1995 birth year. 4:09PM Springfield- Nick Belger, a forward who scored 15 goals and 25 assists. 1994 birth year. 4:07PM Janesville- Drew Callin from Des Moines (USHL), 18 year old forward scored 5 points. This is Janesville's last pick of the draft. 4:05PM Michigan- Robert Smythe, 1994 forward, scored 19 goals and 26 assists. Remember the Tomahawks don't pick again until after round five. 3:43PM Springfield- Colin MacGilvary, defenseman from the New Hampshire Monarchs. 10 points in 42 games. 3:42PM Port Huron- Bryan Yim from the Indiana Ice Yim. played 43 games with the Fighting Falcons last season before his call-up to the USHL. 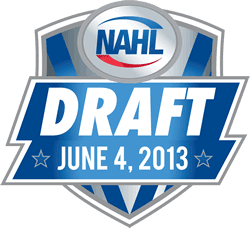 Thoughts so Far-Brett Young, goalie, that the Tomahawks picked in the second round has us here at the blog really excited. Great pick up, and hopefully he'll be able to make the team. He's as big as Truehl was body wise. Last season he had 6 SO and a GAA under 2. Looks Like a Great Player. Brauer was a state champion in Minnesota last season. Michigan Warriors will not pick in the second round as they make a trade with Minot. The Warriors receive from Minot Darren McCormick. 2:50PM Springfield- Gabe Grunwald, goalie. Has played 15 NAHL games. Stands at 6'4 190. 2:36PM: First pick is underway. It comes from the Killer Bees in the South. 2:31PM: Still no first draft pick for any team yet, as trades are still happening, but hopefully soon we'll get underway. Remember we are only covering the North Division and the Johnstown Tomahawks. 2:23PM: The Soo Eagles will have the most picks in the division with 12. Janesville has the least with 3. 2:14PM: Tomahawks will have 5 picks unless they make any trades today. Round 3,4, and 5, the Tomahawks will not pick any players as they traded those away during last season to get JB Baker, Mitch Hall, and Colin Brennan. All in separate deals. 2:08PM: Minnesota Magicians trade #1 pick, details still being finalized. A ton of trades are happening right now which is causing the Draft order to bounce around a little differently than what is listed below, but the Tomahawks will still pick 14th in the first round. This draft goes VERY FAST, only 2-3 minutes between picks. Here at the blog we will try and keep up the best we can. Only minutes until the draft begins. Mike Gosnell predicts that the Tomahawks will draft a Strong D-man with Johnstown's first pick. Remember we are covering all the Johnstown Tomahawks news today, but on top of that we'll be breaking down all the news from the North Division. The first pick that will take place in the north will come from the Michigan Warriors, with the 6th pick overall. Last season the Warriors finished last in the division with a record of 19-32-9. Port Huron Fighting Falcons trade there first round pick to the Aberdeen Wings. Port Huron in return get's The Wings 2nd and 3rd Round Picks. Tomorrow is the NAHL draft. Last season it was the Tomahawks' first big event for their first season, now it's all business, as the team looks to build a championship team for this upcoming year. Here at the blog we (Jon Kohan and Mike Gosnell) are going to be doing something that's never been done before, well never done on this blog before. LIVE BLOG. What is this so called "Live Blog" and why are we doing it? Tomorrow is a big day as the Tomahawks will be filling out their roster to the 30 max players the NAHL allows. Currently the team is at 25. As the draft is going on you'll be able to come here to our blog and see live updates with our insight on the players being drafted. Of course our main focus is going to be on the Johnstown Tomahawks, but we're also going to try and do our best to cover all the players drafted in the North Division. The Tomahawks' will have the 14th pick in each round, except for round 3,4,5,(where the Tomahawks won't have a pick) because those picks were traded during the season to get, JB Baker, Mitch Hall, and Colin Brennan. You can listen to the draft on Fasthockey.com for free, and check out the Tomahawks official Facebook (here), Twitter (here), and website (here) for updates as well, but our blog, and Facebook and Twitter page, will be the only place in the WORLD where you'll be able to get all the information and opinions the second they happen from two die hard hockey fans. So this is how it'll work. BOOKMARK this page! We will be updating this page all day with the newest information at the top of the page. We will provide a link throughout the day tomorrow on Twitter and Facebook, but this will be the page you'll come to. You're not going to find coverage like this anywhere else, at least juniorhockey wise. We hope you join us tomorrow. You can chat with us on Facebook, during the draft, and in the comment second on this blog. For NAHL Draft information you can click here.